Ahead of Mary Foudy O’Halloran’s exhibition Weighed at Ballina Arts Centre, Catherine Gilmartin spoke to the Gort-based artist about her work. Working with mixed media, building up layers, making marks, balancing tints and tones in the process, Mary’s work often re-examines the past in the now, questioning ordinaries and the familiar; often objects of loss. 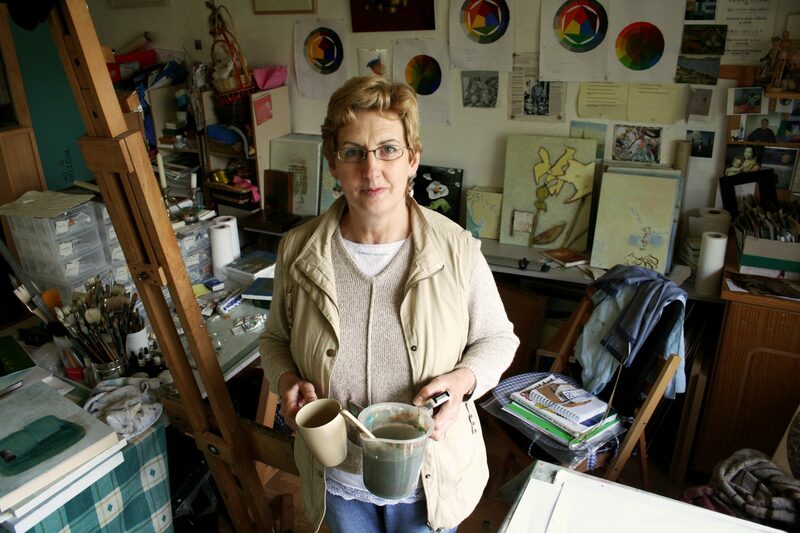 Mary goes on to explain how the initial motivation for her creativity takes place: “My work begins with a subject that has somehow inspired or touched me. There is an endless list of possibilities open to me and that is exciting. Somewhere along the work process each piece takes on a life of its own and it takes you to another place, that of making the piece work by getting the balance right and getting the tones to sit, until I have a result that pleases me and works aesthetically. The small pieces which make up this exhibition became obsessive. Each one so much the same, yet very different. They are pieces of a life. The work is very tactile; the smaller pieces very smooth and almost sculptural. The work on the old blanket a contrast in their awkward roughness. “I have always loved everything about paintings and colour – even the smell of oil paint. I am largely self- taught, though the chance to study for my BA pushed my work into new directions and was a great experience. I couldn’t imagine my life now without working”.